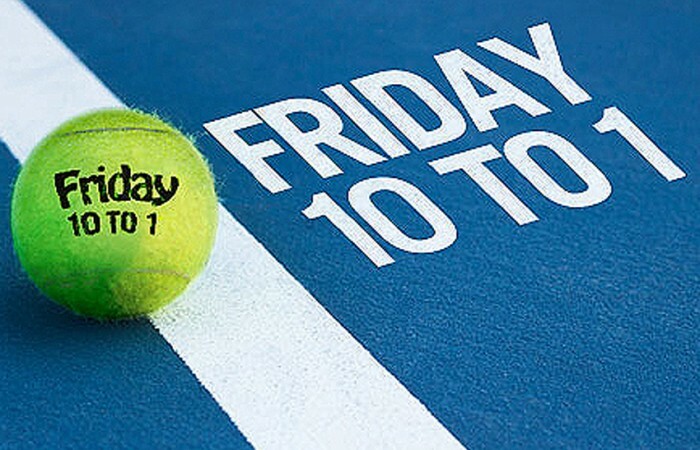 In this edition of Friday 10 to 1, we take a look at 10 of the most iconic, intriguing and famous post-match tennis celebrations. One of the main things that separates tennis from a whole host of other sports is the individual personalities that shine through on the court. Players win fans for their reactions, mannerisms and personal style, all of which are evident in their post-match celebrations after an exciting win. For your viewing pleasure this Friday, here’s a look at 10 of the most iconic, intriguing and famous post-match tennis celebrations. One post-match celebration that has recently gained traction has been that of the shuffle. And that can be attributed directly to the rise of LMFAO and their hit single “Party Rock Anthem”. One half of the American electronic duo, Redfoo, has proved quite the tennis fan, coming out to support his favourites at the 2012 US Open. 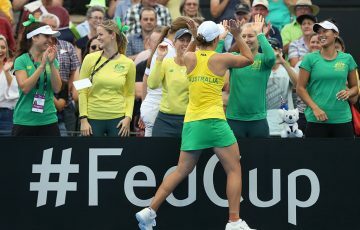 He was in Sam Stosur’s player box for her second round win – prompting this post-match boogie from the Aussie paying homage to the music video’s iconic dance, which you can watch below – and later in the tournament was supporting Victoria Azarenka. The Belarusian celebrated her semifinal win in front of Redfoo in much the same way. The expressive Brazilian was at his full-flowing best on Parisian clay, and the French crowds adored him. 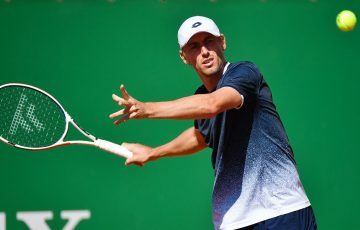 After coming back from the brink to defeat Michael Russell in the fourth round in 2001, Kuerten returned that love by drawing a heart in the terre bateau and acknowledging the crowd from within it. 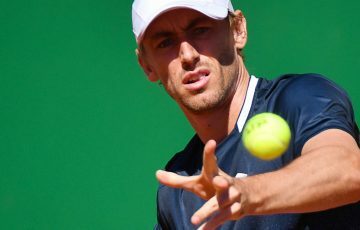 It was a gesture he repeated a few days later when he clinched his third Roland Garros title with a win in the final over Spain’s Alex Corretja, to much fanfare. 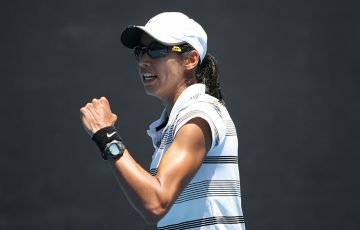 Ivanovic has always been vocal and emotive on court, thanks to her rallying cry of “ajde!” and frequent fist pumping. Her high-pitched squeal is generally reserved for when she clinches big wins, which came predominantly in the 2007 and 2008 seasons. Truth be told, it’s extremely annoying, but there’s no doubting this celebration is one of the Serbian’s trademarks. The Russian has always been a little different. Remember this? And this quirkiness extends to his post-match celebrations, which are military-style salutes. With his buzz cut and combative nature on court, it’s undoubtedly fitting. Over the years, Serena has jumped for joy, screamed in delight, clutched at her heart and thrust her hands in the air after winning many of her Grand Slam titles. 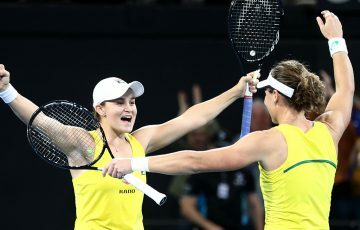 But an increasing trend throughout her career has been her propensity to collapse to the court after a major victory, adding gravitas to her already impressive achievements. It began when she defied critics to win the 2007 Australian Open (first video), occurred again when she bested bitter rival Justine Henin in a stunning Australian Open final in 2010 (second video) and in each of her Grand Slam victories following her year out of the game with health problems (third and fourth). This Superman-esque celebration was pioneered by the charismatic Australian Andrew Ilie, who during his exciting runs at the Australian and French Opens more than a decade ago tore his shirt from his torso after big victories. Novak Djokovic demonstrated the move on Ilie’s home soil some time later, ripping open his shirt in the heat and excitement of the moment after his epic defeat of Rafael Nadal in the final of Australian Open 2012. We’re not sure what prompted this, but for as long as we can remember, Rafael Nadal has bitten his trophies after winning titles. Not kissing or hugging them, as is “normal”, but biting them. And it seems sterling silver no longer solely whets his appetite. He’s developed a fondness for crystal, as the second video attests. Tennis’s more regal champions celebrate with a grand acknowledgment of the crowd. And none do this better than Andre Agassi and Maria Sharapova. 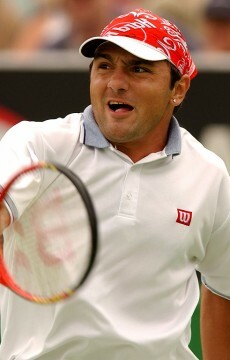 Agassi increasingly grew into his role as the great ambassador and elder statesman of tennis, evidenced by his gesture of blowing kisses and bowing to all corners of Centre Courts around the world after victories. 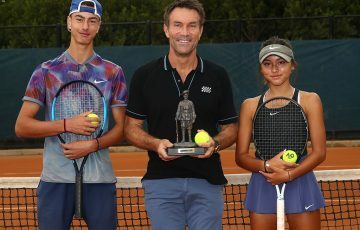 Likewise the statuesque Russian adopted a similar ritual when she burst onto the scene in the mid-2000s, and like her fellow career-slammer Agassi acknowledges all sides of the crowd following her frequent wins. The Frenchman’s electrifying game and natural exuberance attracts countless fans to the game, and he makes his joy known to them any time he scores a win. Tsonga’s bounding, muscle-flexing, thumbs-up celebration radiates energy and thrills the crowds, and is perfectly suited to his personality. Possibly the most iconic of all tennis celebrations is Andrea Petkovic’s “Petko Dance”. The German apparently spontaneously busted out her best dance moves after defeating Nadia Petrova at the 2010 US Open (first video), and spent much of the next year doing it – and variations thereof – following her wins. The dance after the win over Sharapova (second video) possibly served to motivate the Russian in future matches against Petkovic, who has never since lost to the German. “More than anything, I sensed that she was tired – probably a lot of the dancing that she’s been doing – and I took advantage of it,” Sharapova said after beating her in Miami 2011. But whether or not you consider it disrespectful to her opposition, there’s no doubting her dancing has injected a healthy dose of personality into professional tennis. It even inspired a song, which you can hear – along with more vision of the Petko Dance – in the fourth video.